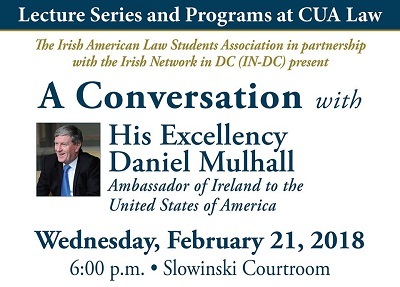 On Wednesday, February 21st, the Irish Ambassador to the United States, Daniel Mulhall, spoke at Columbus School of Law at the Catholic University of America. The event was hosted by the Irish American Law Students Association in partnership with the Irish Network DC (IN-DC) and Catholic University of America Program in Irish Studies. The event was organized as a conversation between CUA Law Dean Daniel F. Attridge and Ambassador Mulhall, with CUA Law Pro Bono Coordinator Aoife Delgary providing an introduction. A summary of the event is available here. Mulhall, David, "A Conversation with His Excellency David Mulhall" (2018). Other Lectures & Events. 12.